I'm almost embarrassed to be sharing this with you. There are a number of far more interesting recipes from my cooking exploits the past few months that I'm sure you'd find exceedingly more appealing. I should be telling you about the carrot cake scones with cream cheese icing and toasted pecans I made for Easter brunch this spring, or about Joy the Baker's creamy pumpkin pie bars that were as creamy as advertised, or even the maple pecan shortbread that provided steep competition for the family favorite cashew butterscotch bars this Christmas. Even another quinoa salad would be a welcome alternative to a dish prepared with the most rudimentary of ingredients. An ingredient that is most often associated with the word "humble" or the visual of a hippy, granola nut who can do all those weird yoga headstand poses and never uses any plastic bags ever. Just places the organic kale and unwaxed apples and gnarly beets straight into their grocery tote that was woven together with recycled barley husks and hemp fibers. I'm under no such illusion that there is anything remotely exciting about lentils -- nor lentil soup for that matter. If there was a Tinder application dedicated to food it would certainly be the dish that was most often swiped to the left while everyone fawned over sexier dishes like runny fried eggs and salted caramel sticky buns and avocado toast. This is absolutely the part where I should abort mission completely, shout "Just kidding!" and start in on a diatribe about some saucy bucatini number instead. And yet in this particular moment, lentil soup feels… right. Its simplicity is fitting with the post-Christmas, pre-New Year's doldrums, a period when the excitement from the holiday season has started to ebb, and the blank slate of a fresh year is still simmering on the horizon. It's a time when slowing down feels like the only option, and, for once, an option that no one is inclined to question because they too are slowing down -- catching a breath before barreling forward into 2016. 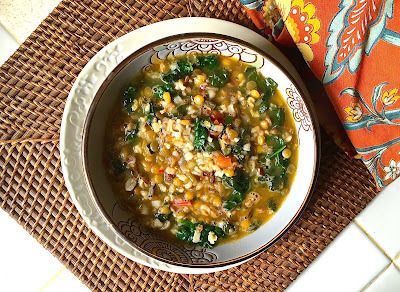 This lentil soup requires minimal effort, and a scant number of ingredients -- most of which are negotiable aside from the actual lentils. There should be some form of onion sautéed with garlic, a grain of sorts, a few handfuls of something green and leafy to add textural interest, and a vegetable broth that may or may not be flavored with tomatoes, but it's all really just a template. The whole thing comes together in less than an hour -- barely enough time to watch an episode of "Jessica Jones" on Netflix, and it will still somehow be perfect in spite of (or because of) the lack of effort that went into it. The ease of its preparation is perhaps as alluring as the soulfulness of its flavor during a time when we could all use a bit more soul. A time when we all need a break from the standard performance of everyday life in a social media-driven world. And a time when it's okay to be unapologetically enough -- without the pressure to be anything more. In a large, heavy-bottomed pot, heat the olive oil over medium heat. Add the onion and sauté over medium heat for 5 minutes or so. Reduce heat, add the garlic, and sauté for another 1-2 minutes. Add the vegetable broth, tomatoes or tomato paste mixture, thyme, and season with freshly ground pepper to taste. Bring to a boil, then add the lentils and grains. Bring back to a boil, then reduce the heat slightly and simmer, uncovered until the lentils and grains are just tender -- approximately 30 minutes. You want the lentils to be done, but still have some heft to them. Add the greens and simmer a minute or two more until the leaves are just wilted. Serve immediately -- perhaps with some toasted bread, or perhaps with nothing but a spoon. It's enough just as it is.